Stamped concrete is a continuous concrete surface that has been molded or "stamped" to appear very much like individual pavers, bricks, stone, or even wood. Stamped concrete offers several benefits over traditional patio pavers, and can be an excellent solution for a patio, pool deck, walkway or driveway. It is sometimes even used to create permanent and durable interior flooring. When used indoors - such as a basement floor - installation is relatively fast when done by a professional, and the end result can be a beautiful, natural-looking floor. However, when used outdoors, there are several factors to consider when deciding whether to use stamped concrete or pavers. These include frost heave, cracks, and aesthetics. Frost heave is when the soil underground freezes and causes the ground surface to deform. 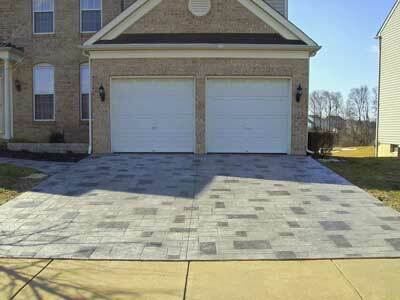 When installed in colder climates, pavers are more susceptible to deformation from frost heave than stamped concrete. This is because the amount of continuous surface for pavers is smaller, allowing more freedom of movement. For covering a naturally uneven surface, pavers might be a good choice. However, for covering a flat surface, stamped concrete is most often the superior choice. One potential drawback of using pavers is a result of the spaces between them. Pavers are susceptible to weeds growing through the cracks between the individual paver stones. Weeds will not grow through the “cracks” of stamped concrete because the "cracks" or "mortar lines" are simply part of the imprinted design of the continuous concrete surface. The last factor to consider is aesthetics. In the past, many people considered pavers to be more aesthetically pleasing - perhaps because pavers sometimes imitated the look of some stone or brick surfaces more closely than a continuous concrete surface. 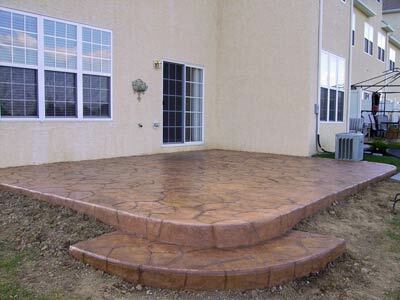 It is also generally true that stamped concrete will never look identical to the “real” surface that it is imitating. 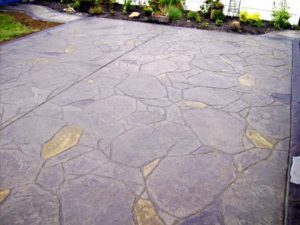 With modern advances in stamping and coloring techniques, however, stamped concrete patios and walkways can be crafted to very closely mimic the look of real stone, slate, granite, or cobblestone. Because of this, and the convenience of the more maintenance-free surface, an increasing number of homeowners and business owners are choosing stamped concrete over patio pavers. If you have any questions regarding the benefits of using stamped concrete for your upcoming project, please contact us using our online contact form, or by calling one of the numbers in our footer below.